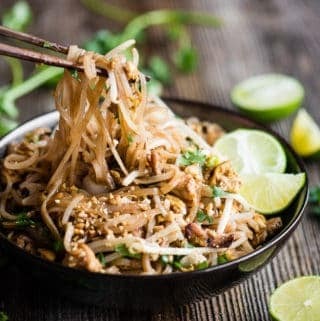 Chicken Pad Thai made in your own kitchen with fresh ingredients and a delectable sauce is the best pad thai you’ll ever enjoy! This recipe turned out better than any pad thai I’ve ever ordered in a restaurant. This is so much better than take out! Plus, when you make this chicken pad thai recipe yourself, you have total control over the quality and freshness of the ingredients you use. Pin it to your ASIAN CUISINE BOARD to SAVE it for later! I crave Chicken Pad Thai all the time. 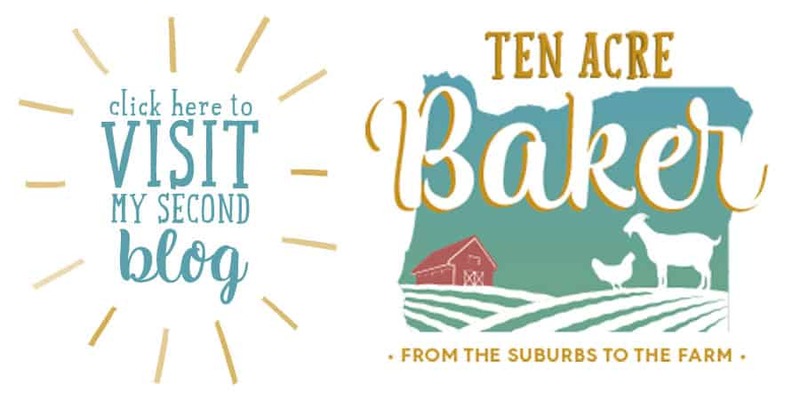 Ever since we moved out to our little ten acre piece of heaven, take out isn’t as convenient as it used to be. I needed to step out of my comfort zone and start making more Asian recipes to satisfy those cravings! 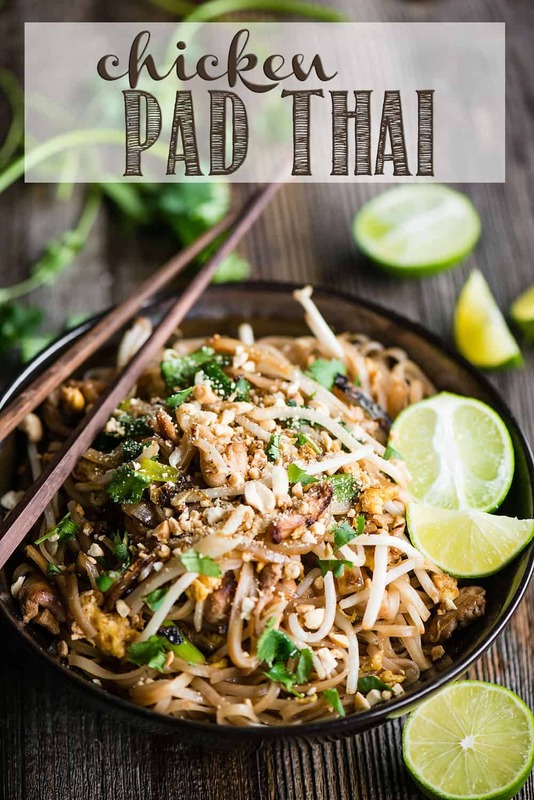 One of my goals was to make the best Pad Thai recipe out there. I think I succeeded! If you get mean Pad Thai cravings like I do, you might be equally as interested in my Pork Fried Rice, Perfect Cashew Chicken, Shrimp Summer Rolls, and Beef Stir-Fry recipes! 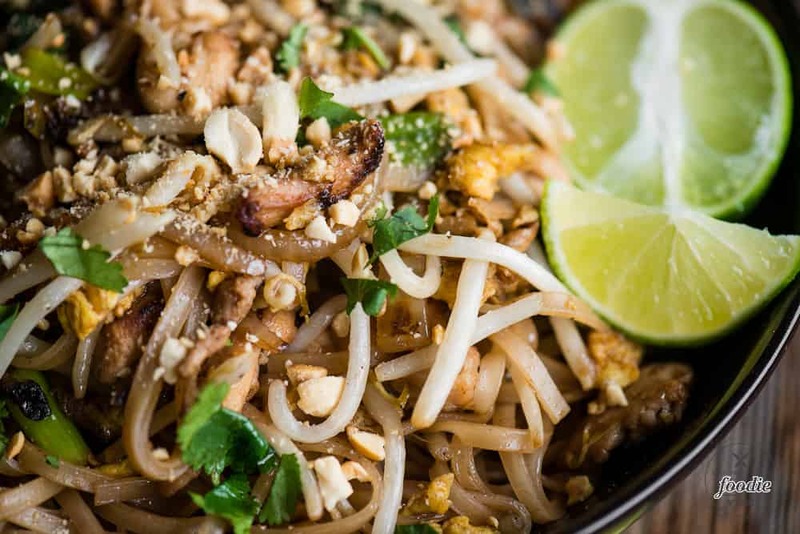 The most basic definition of Pad Thai is that it’s a Thai dish based on rice noodles. Pad Thai is commonly knon as a stir-fried rice noodle dish commonly served as street food, as well as in most restaurants, in Thailand. 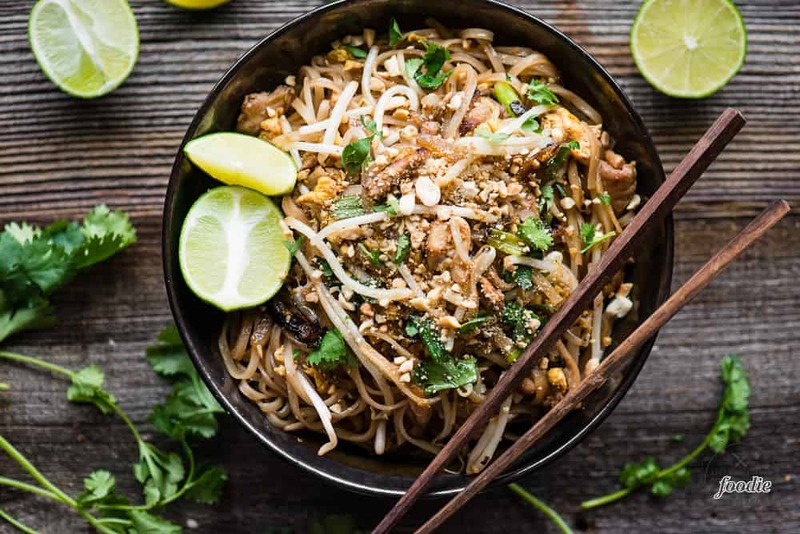 The defining ingredients are usually rice noodles, eggs, some kind of protein like tofu, chicken, or shrimp, Pad Thai sauce (which I will explain how to make below), and chopped peanuts. Vegetables are often added including Mung bean sprouts, but I prefer adding other various vegetables for flavor, color, texture, and vitamins. Pad Thai needs to be cooked in a wok. The purpose of using a wok is to be able to cook over very high heat so that the food gets seared and heated through without over cooking. When cooking in a wok, the heat transmits evenly all the way up the sidewalls of the wok, creating a large cooking surface area. It’s also very easy to stir the ingredients while they are frying for even cooking, hence the term stir-fry. If you have a gas range with a powerful flame, a high quality wok pan should be added to your must-have kitchen pots and pans collection. If you’re like me and have an electric or induction cooktop, you won’t be able to use a wok pan because the surface area in contact with the cook top is minimal and won’t travel up the sides of the pan. I bought an electric wok and it is downright fabulous and works with all of my Asian recipes. There are three main components when making your own Pad Thai recipe: the noodle prep, the sauce, and the stir-fry. Be sure to read my notes below about the best way to prepare the noodles and what’s required for the sauce. Any time you stir-fry, you’ll want to have all of your ingredients prepared, measured, and cut. It’s a very fast cooking technique and your recipe will turn out best if everything is ready to go. To cook Chicken Pad Thai, you will cook the chicken first in small batches so that it browns nicely. As you cook your ingredients, you will transfer them to a separate plate so that they remain warm but don’t get crowded in the wok. The final batch of chicken is cooked with onions. Next you’ll reduce the heat on your wok and cook the scrambled egg. You’ll add the chicken and onions, softened rice noodles, mung bean sprouts, and the warm Pad Thai sauce to the wok that contains the egg. I always like to garnish my Pad Thai with chopped peanuts, fresh cilantro, and lime wedges. How to you make Pad Thai sauce? The secret ingredient to a rich, dark, and flavorful Pad Thai sauce is tamarind paste. It’s not cheap, but you only use a couple tablespoons with each recipe, so it goes a long way. For my pad thai sauce, I use a combination of tamarind paste, fish sauce, honey, oyster sauce, rice vinegar, and red pepper flakes for spice. You thought I was going to say soy sauce, didn’t you? Not in this Pad Thai recipe! To make the sauce you simply combine all of the ingredients in a small pan and heat until everything is dissolved. Keep it warm until you’re ready to add it to the rest of your ingredients. Rice noodles don’t need to be cooked. Not like traditional pasta, anyway. To prepare the Pad Thai rice noodles, you simply need to cover them with boiling water. No cooking on the stove required. Let them sit in the hot water for about five minutes until they are soft. Then, simply drain the noodles and toss them in some oil to prevent them from sticking. When you throw them back in the wok with the other Pad Thai ingredients, they will heat through but not get overly cooked. Chicken Pad Thai made in your own kitchen with fresh ingredients and a delectable sauce is the best pad thai you'll ever enjoy! Put noodles in a large bowl and add boiling water to cover. Let sit until noodles are just tender, about 5 minutes. Drain, drizzle and toss with about a tablespoon of oil to keep from sticking, and set aside. To make the sauce, combine tamarind paste, fish sauce, honey, oyster sauce, rice vinegar, and red pepper flakes in small pot and heat on low until all ingredients have dissolved. Keep warm until ready to use. See note. Reduce wok heat to medium. Add whisked eggs to wok and stir to scramble. Add chicken with onions, softened noodles, and mung bean sprouts to wok. Add sauce (you may not use all of it). Stir to combine and allow to heat through. Add cilantro and chopped peanuts before serving. Garnish with lime wedges. This sauce makes more than enough for this pad thai recipe. You may choose to use it all, or add just the right amount based on preference and save the rest for the next batch of pad thai. can you give the recipe in metric measurements? I would have to google each one. My recipe card doesn’t let me convert just a single recipe. Sorry! This is a legit recipe. I see so many online recipes that say tamarind is a key ingredient, and then go on to give you a recipe that doesn’t include tamarind! That sour citrusy flavor is essential. And I saw one recipe that called for peanut butter and maple syrup. Seriously. So kudos, girl! Hahaha. Great comment. Thank you! Yes – this is one of my favorite recipes for sure!